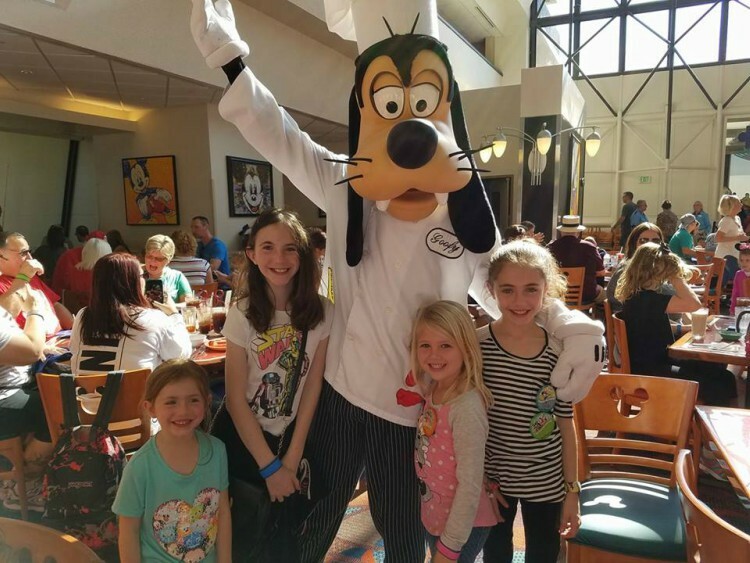 Over the years our family has always made it a point to eat breakfast at Disney’s famous Chef Mickeys located at Disneys Contemporary Resort. It was always a restaurant that my kids and I looked forward to eating at. My kids loved it because they got to see all of the main Disney characters and get their autographs. I enjoyed it because it was a buffet and when you are a mom with picky eaters, Disney buffets are the best. 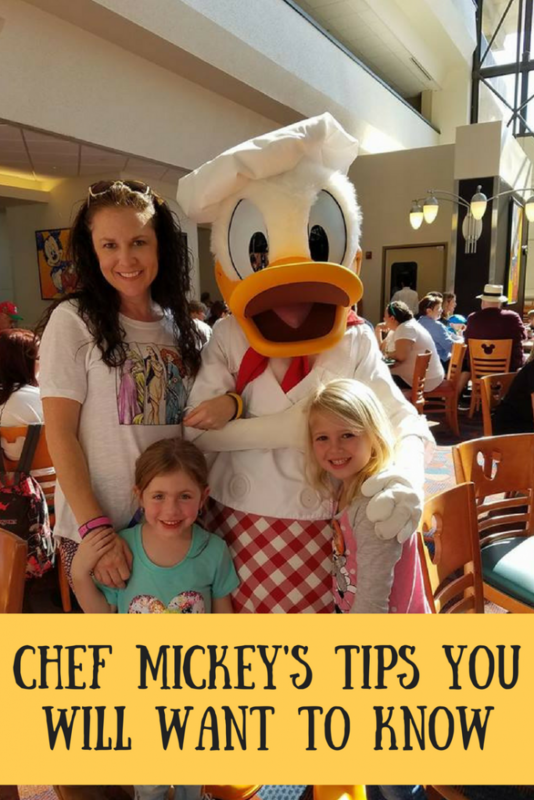 Like most Disney food establishments Chef Mickey’s is expensive so I wanted to share Chef Mickey’s Tips You Need to Know. Chef Mickey’s is great for any kid or adult that loves the original Disney characters such as Mickey Mouse, Minnie Mouse, Donald Duck, Goofy and more. If you are considering making dining reservations at Chef Mickey’s, here are some tips you will need to know. If you want an early breakfast make sure that you make reservations as soon as possible. If the reservation that you want is not available, consider placing your party at 2 different tables and keep trying. Often times, people will over reserve so something might come up unexpectedly. Chef Mickey’s is a very popular character dining establishment at Disney, so it can be hard to get the reservation that you want. When it’s time to be seated if you are not happy with the area of the establishment that you are being seated at, speak up. The last time we were at Chef Mickey’s, our group was seated in a corner spot and the sun was beaming on us. It was not comfortable or enjoyable. Thinking back to this moment, I wish I had asked to be moved to a different table even if that meant I would have to wait longer. The characters go around the entire dining hall, so with that said, when you see that a character is close to your table do not leave. If you are not at your table when a character visits, they will not come back. Do not visit a character that is at someone else’s table. These characters are on a busy schedule and have to stick with it. Have your camera, autograph book, and pen ready. Like I said, the characters have a lot of guests to visit, so be prepared. Be ready for a chaotic meal. Eating at Chef Mickey’s is not relaxing and since the characters visit you at your table, you have to constantly watch for them and get up so you can take pictures with each of them as they approach your table. In addition, it is always crowded and loud. Do not expect amazing food. We’ve only eaten breakfast/brunch at Chef Mickey’s and from our experience, the food is unimpressive. When we go to Chef Mickey’s we tell ourselves that we are paying for the experience and not for the food. Make sure that you block enough time for your meal at Check Mickey’s. From our experience, we normally spend 2-2 1/2 hours here. This includes travel time in addition to eating. If you have not been to Chef Mickey’s, I encourage you to try it at least once. It is a fun experience for kids and even though the food is not amazing a lot of fun memories will be created. Have you been to Chef Mickey’s? Do you have any helpful tips that you can share with others? 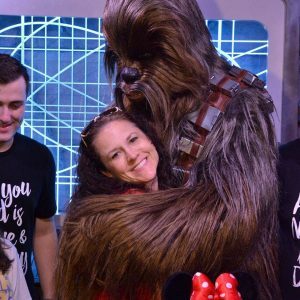 Here are a few Disney posts you might enjoy! Please feel free to share them. We had dinner there in August 2017, it was actually pretty decent. You said the characters didn’t come back if you missed them? We actually had a worker ask if everyone came to our table, when we explained we missed Minnie they sent her right back to our table! I think Chef Mickey is well worth the money, our next trip is in 50 days! We were just at Chef Mickeys in October. We had the dinner buffet and I will say the food wasn’t bad. It’s nothing exquisite but it’s definitely comfort food and a lot of variety. So I would say that dinner must be better than the breakfast! And it really is a great experience. The most rushed part is the charachter portion, other than that it’s at your own pace. It is all you can eat and they have a sundae bar and many desserts also. My kids loved it! We have stayed at AOA and Wilderness Lodge and Beach Club… went to Chef Mickey’s. Some of the times we drove our own car, saved some time, other times we took the bus.. if memory serves me correctly we had to ride the monorail as well. I’d give it 30 mns to get there but then look at all the travel options you have. When you get there, there is always a wait, even if you are on time.